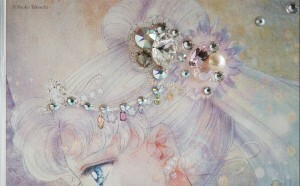 A new item is now available for pre-order from the Official Sailor Moon Fan Club. If you’re not already a Fan Club member, you’re pretty much out of luck as the period to sign up has long since passed. 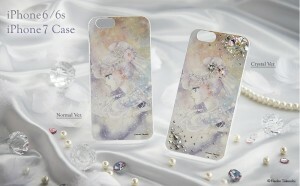 The latest item is a cell phone case for Apple iPhones featuring an image of Princess Serenity by Naoko Takeuchi which was made for the Sailor Moon Exhibit. It comes in a somewhat affordable “Normal Version”, only $20.99 US, or a “Crystal Version” which is a significantly less affordable $140.99 US. Preorders can be done until January 27th and the item will be released in March. What kind of gems account for this difference in price? Any actual precious stones would likely drive up the price much more than $100. These are Swarovski crystals which are basically cut glass. Actually that’s not completely accurate. These are lead glass which is a kind of glass that has a high refractive index which basically means it’s more shiny than normal glass! The case is available for iPhones only and at that it’s only for 6, 6s and 7 models. I’m out of luck to get one to fit my iPhone 6+ but maybe I’ll just buy another Sailor Moon case and stick some rhinestones on it. What do you think of this case? Will you be picking one up? 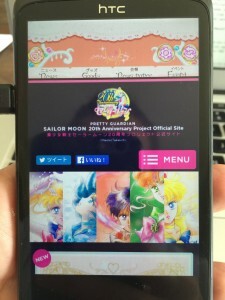 Last week I made a post about a new Official Sailor Moon app for Android phones. At the time I mentioned that the included game was only available to members of the Fan Club. This is not technically correct. One does not need an actual paid Fan Club membership to use the game. 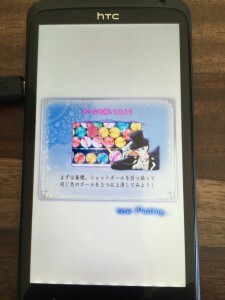 They are in fact able to play it if they have an account for the Fan Club web site even if they never completed registration for the Fan Club, which requires a payment and for them to live in Japan, or use a deputy service. The bad news? You can’t sign up for such an account anymore. The kind of good news? I did sign up for such an account while trying to get a Fan Club membership before hitting a wall and giving up because I didn’t live in Japan. So much to say I was able to use my account to sign in to the app and play this new game. Anyone else with an Android phone who’s in this specific situation can download the app from the Google Play store. The app should be out on iOS devices soon enough. I had a pretty terrible time getting this game working. I tried to load it up a few times and managed to play about a game and a half. My phone is terrible and old, hence I can’t take screenshots with it and instead have photos of the phone, but the app also seems to be somewhat unreliable. I spent most of the time staring at a loading screen which seemed frozen. Once I actually got into the game I was surprised to see it wasn’t quite as much like Bust a Move as I expected. Basically you use your finger to pull back and release the orbs in the little tray on the bottom and launch them into similarly coloured orbs. The orbs disappear and you get points. You have a limited time to do this. Honestly I just played that one game. It was frustrating and after a few more frozen load screens, freezing games and finally a freezing time up screen when I completed a game, I didn’t want to play any more. The game isn’t all that great and it doesn’t have much to do with Sailor Moon, aside from having Sailor Moon symbols and characters. I hope you find my review less disappointing than the actual game. Thanks to Rem and Erica for leaving comments which helped me to get this game working. Update: July 3rd 2016: Users can sign into the app to play the game if they have a Fan Club account that hasn’t completed registration. You can do this without living in Japan. Unfortunately there doesn’t seem to be a way to sign up for a new account at this time. 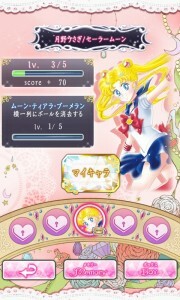 News has been posted on the Official Sailor Moon site about an Official Sailor Moon app. 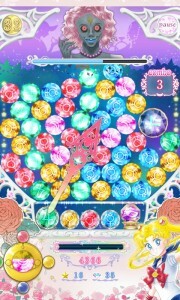 No this is not Sailor Drops, the addictive and frustrating puzzle game which everyone loves to hate. 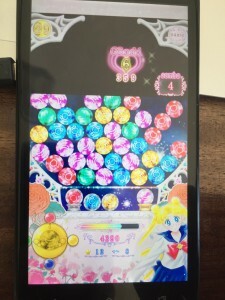 This app is basically just an interface to the official Sailor Moon site with a built in game which it seems you can only play if you’re a member of the Fan Club, which you can only do if you live in Japan. For now the app is only available on Android devices. 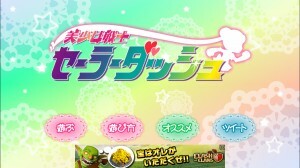 An iOS version, for iPhone devices, will be available soon. Android users can download the app from the Google Play store. I had to rummage through some old Gameboy games and NES controllers to find my old and busted Android phone which has a bad power button so I can’t take screenshots with it. That’s okay because there’s not much to see. It’s basically a wrapper around the site. I got an error at one point and it just said it couldn’t load sailormoon-official.com. There is a button at the bottom which I believe is the link to play the game but it prompts me to log in to the Fan Club which I am unable to do as I could never sign up since I don’t live in Japan. Check out this great photo I got of the app in action! All in all this app seems like a colossal waste of time if you aren’t part of the fan club. This may change in the future but for now I don’t think there’s any value in this. 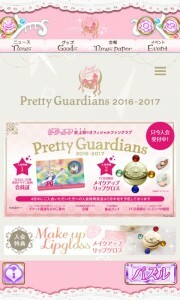 Have you been able to get the app to do anything but surf around the official site and Fan Club page? 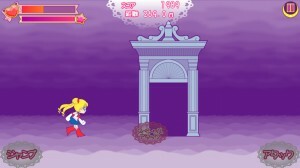 There’s a new Sailor Moon video game but it’s not what you might expect. 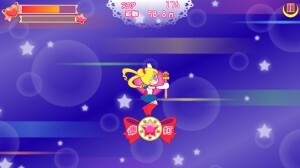 Pretty Guardian Sailor Dash is a new Japanese fan made app for Android cell phones. It’s available for free in the Google Play store. The gameplay is pretty simple. You are Sailor Moon and you scroll through the screen automatically. 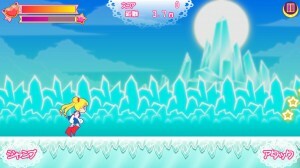 You can jump or shoot as well as use a special button to consume all of your energy to do a special move. 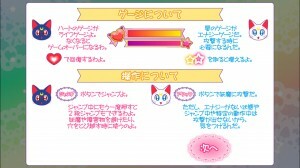 Special items included in the game include Luna P, the Holy Grail, the Key of Space-Time and many of Sailor Moon’s transformation items. I’m not sure what other levels may entail as the game is really hard and I haven’t passed the first stage. I seem to inevitably end up falling in a hole with some missed jump rather than running out of health. 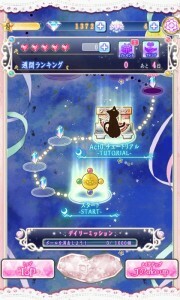 Different levels seem to be named after different Sailor Guardians though it’s unclear if you actually play as them or not. 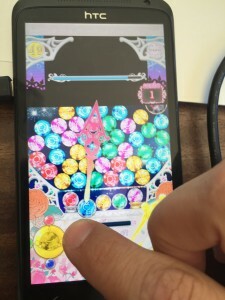 The game is free and supported by ads. If you disable mobile data and WiFi the ads won’t show up. If you have one of the more popular cell phone models you’re in luck. 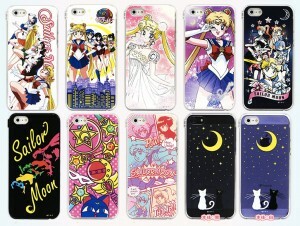 The official Sailor Moon site has announced that Bandai is releasing relatively inexpensive cell phone cases and stickers in Japan. The most recently announced items are a series of nine cell phone case designs for the iPhone (4, 4S and 5), Xperia (Z and A) and Galaxy (SIII and S4). You can buy them from the Bandai Premium site. 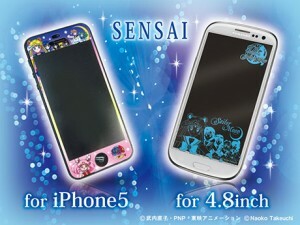 There are a wide variety of designs available, each priced at 2,100 yen, which is about $21 US. In addition to these cases some cell phone stickers were announced a short while back. There are a privacy protector and sticker case for the iPhone 5 and some smaller stickers which could be placed on virtually any cell phone. These items are available for pre-order from CD Japan. 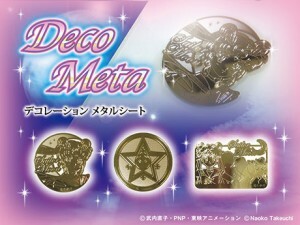 You can access these from the following links: Sticker case, privacy protector, group sticker, Sailor Moon sticker and Crystal Star Brooch sticker. They are priced anywhere from about $4 to $7 US.